Every form in Leadpages includes required email field by default. But there are a lot of great reasons to skip collecting a visitor’s email address on certain forms. Whether you already have a contact’s email address or you just don’t need it, read on to create a form without a visible email field. If you already know a visitor’s email address—maybe you’ve sent them to your page from a link in an email—we recommend setting up URL mapping so your form collects their email address behind the scenes. Check with your service provider to determine how they handle duplicate email addresses. Some may overwrite data if the same email address is submitted more than once. This can be a problem if choose to hide your form’s email field without setting up pre-population. Always enter a default value (such as name@website.com) that can act as a fallback. That way, your form will still submit, even if you aren’t able to match an email address to a visitor. Hover over your form and click Edit Integrations to open its settings (or, drag a new form widget onto your page). Keep in mind, your form may be located within a pop-up on your page. Make sure you have at least one field other than email on your form. Click the email field in the sidebar to open its settings. Check the “This is a hidden field” option. Then, give the field a default value that looks like an email address (such as name@website.com). Click Done to save your field settings, then click Save to close your form’s settings. Now, visitors will be able to submit your form without entering an email address. Open your form settings by clicking any call to action on your page that opens a form. Scroll to the bottom of form settings panel and click Show advanced options… (under the “Hidden form fields” section). 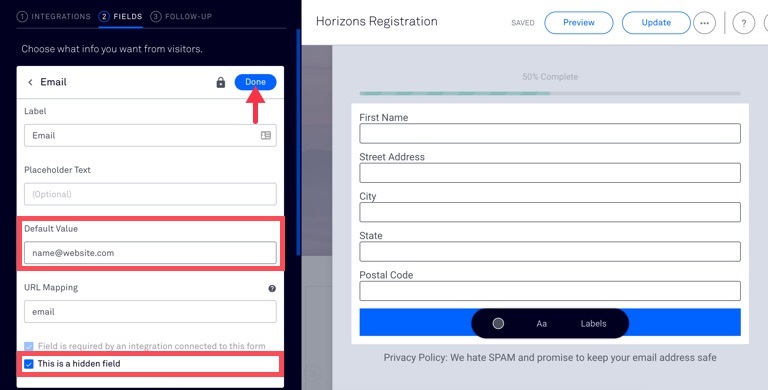 Click E-Mail Address under the “Form Fields” section. Change the field role to “Hidden”. Enter a default value that looks like an email address (e.g. name@example.com). Click Okay to save the field settings, then Okay to save the form settings. Then, save your page itself. Return to your form’s email field settings (using the steps above). Enter a URL variable (also referred to as a query string or UTM parameter) to use for pre-population. It’s best to choose a simple, intuitive variable such as “email”. Your variable can contain a hyphen (-) or underscore (_), but other special characters may cause issues. Set up a link that dynamically includes your contact’s email addresses and your variable—for example, yoursite.com/your-page?email=name@example.com. You’ll need to check with whatever service you’re using to determine how to include email addresses in links. If you have any questions about the steps above, don’t hesitate to reach out to our fantastic support team—they’ll be happy to help!